Panama City Beach condo: "The Captain's Cabin" Great View. "The Captain's Cabin" Great View. This wonderful 9th Floor Gulf front condo over looking the beautiful Emerald waters of the Gulf of Mexico. Nicely furnished and decorated for your enjoyment. Close to restaurants, entertainment and shopping. Across the street from Walmart. Relax at the magnificent resort style pool and spa. Unit comes with its own parking space on the 9th floor. 1 bedroom with King, Bunk area, Brand new Queen sleeper sofa and 2 bathrooms The Shores of Panama Resort charges a separate fee at check in. It is called a pool amenity fee. They issue everyone a wristband that allows you access to the Resort Style Pool. They do this to keep the pool area for Paying Guests only. So if you do not have a wristband you cannot swim in the Pool. The fee is a Flat Fee of $50.00 ( Not per person) This fee is for your Parking pass and Pool wristbands. You purchase them from The Concierge Desk. Right next to the Front Desk on the first floor. 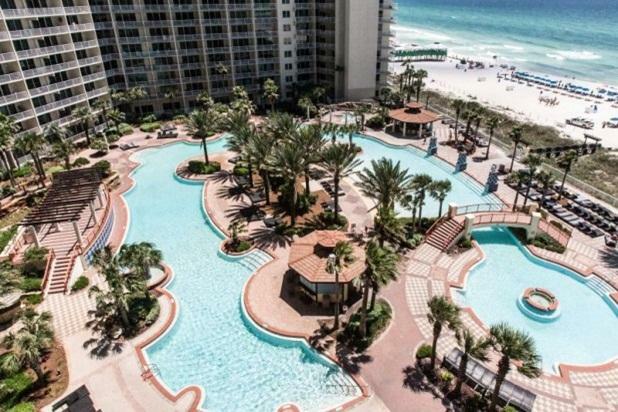 Picturesque Panama City Beach is the number 1 location for family fun and adventure along the pristine emerald coast. It is the go to destination in the south eastern United States for millions of people each and every year. The Shores of Panama Resort is a very big resort. During peak Summer Season it can be very busy with many people. So please be aware the elevators can be packed during check in and check out times. The Lagoon style pool is wonderful along with the white sugar sandy beaches. Great views and the location is tops. Most convenient parking and elevator. The condo is so nice and Carol was extremely helpful and attentive to us from the beginning to end. There is no doubt we will be back! Owner's reply: Thank you for taking the time to write a nice review. I am Happy that you enjoyed your stay. You are welcome back anytime. Carol Succop Carnero Beach Quest Vacation Rentals PCB, FL. Very clean; great views to beach; responsive owner. Very convenient location with on-site amenities. Will definitely stay here again. Owner's reply: Thank you for the nice review. I am glad you had a good time. Come back soon. Carol Succop Carnero.